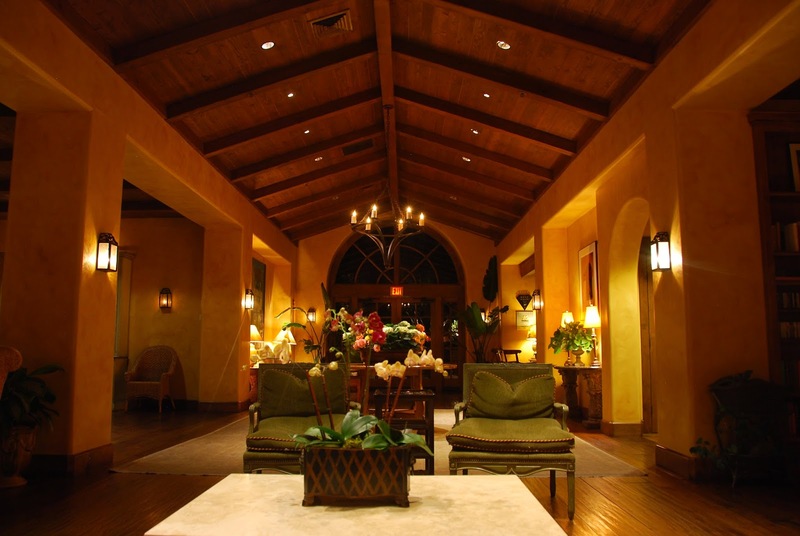 As you drive through the gates of Bernardus Lodge, you are immediately greeted by old world elegance. Located amongst the oaks and vineyards of picturesque Carmel Valley, the gracious intimacy of this charming resort with an epicurean flair felt like we were coming to a friend’s private villa in Italy. 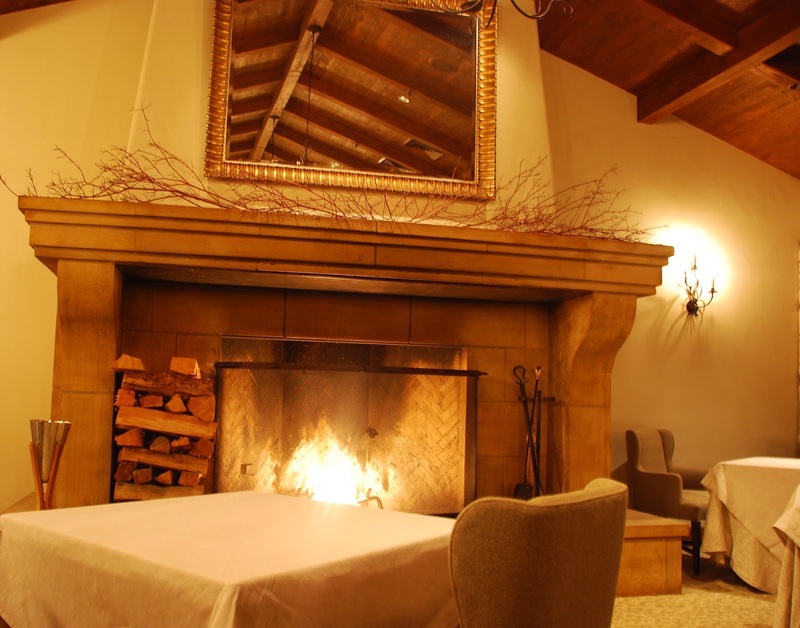 Cozy fireplaces and wood beamed ceilings are the backdrop to dining at their unparalleled Marinus Restaurant, voted one of the Zagat's top restaurants, and further voted one of The Dining Duo’s top restaurants in the country. Recently, Marinus received a top-to-bottom refurbishment. Taking full advantage of the resort’s pastoral location, the new intimate design which seats approximately 15 tables artfully combines present comforts with the natural sophistication of Carmel Valley wine country. Hand forged chandeliers and wall sconces from Normandy add drama to an intimate room, while walls in soft shades and natural tones exude warmth. In addition to the massive signature stone fireplace, inviting custom chairs, linens on all tables and crewel drapery over classic French windows add texture and depth while elements of the outdoors are brought inside. 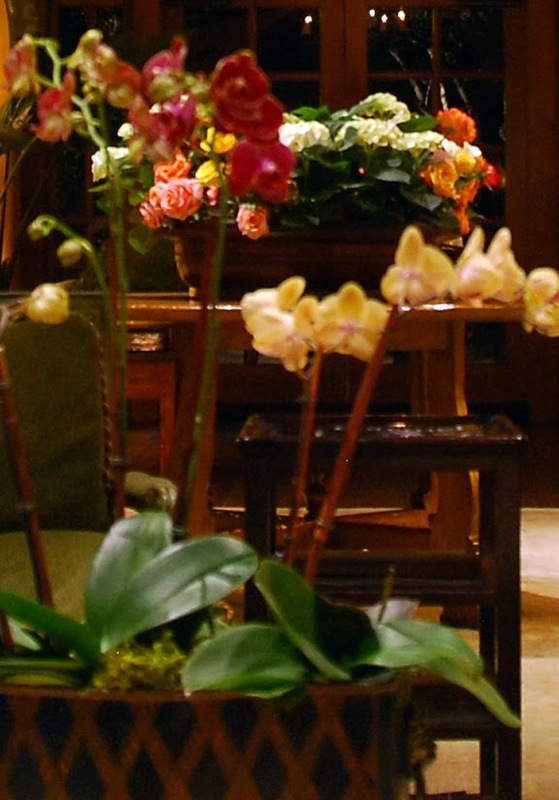 With fresh flowers atop a long wooden table adorned with wine and glasses, wood crackles in the fireplace, and before a morsel of food is served we feel all warm and fuzzy about this place. Chef Cal Stamenov is a maestro of California natural cuisine, and uses only local, organic produce from Bernardus’s own gardens and also sourced from local farmers, fisherman and foragers. 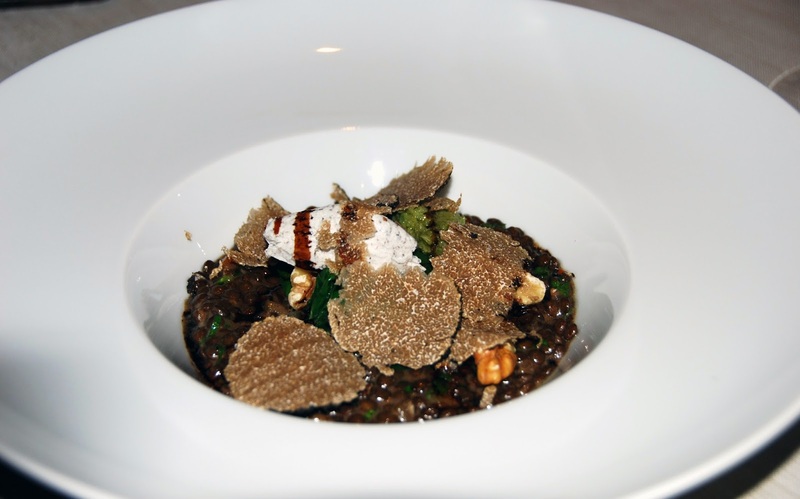 Since we had heard rumors that Marinus had one of the best tasting menus in the Carmel area, we opted to treat ourselves to the chef’s Tasting Menu, which compared to the likes of Per Se in New York (and it does compare, we are pleased to say), is truly a bargain at $125 per person. With a wine list of more than 1,800 fine wine selections, we also highly recommend that you add the wine pairing portion (again, a steal at $95 per person), which provides an outstanding selection of wines in one meal. Let us just say that our socks were knocked off with this meal and we have not stopped raving about it. 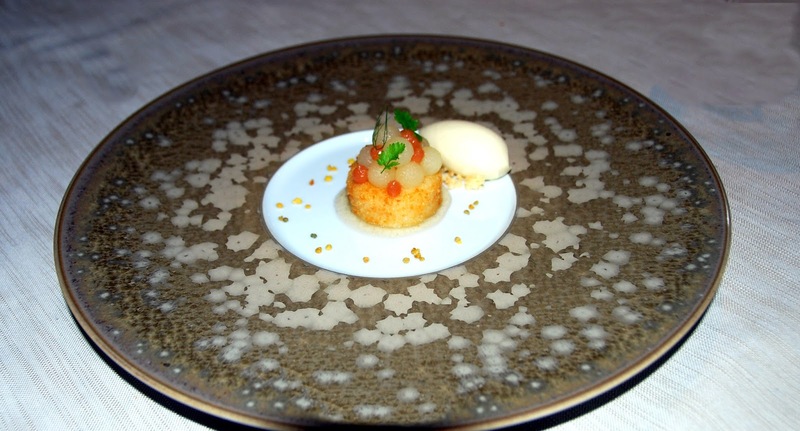 From start to finish, everything was superbly prepared, marvelously presented and excellently served. 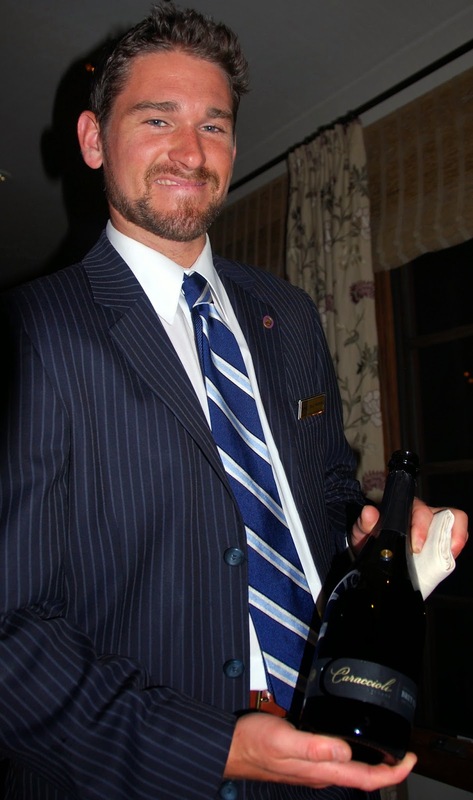 Upon the recommendation of the dashing Som, we started with a 2007 Caraccioli Cellars Brut Cuvee from the Santa Lucia Highlands in order to celebrate our great fortune at having this dining experience. When the Carmel Valley grass fed beef tartare prepared with spicy aioli, quail egg yolk and black truffle came to the table, Michael just about wet his pants with delight. We paired this sensational taste sensation with a 2011 Domaine Alain Grillot Crozes Heritage Blanc which originated in the Rhone Valley of France. 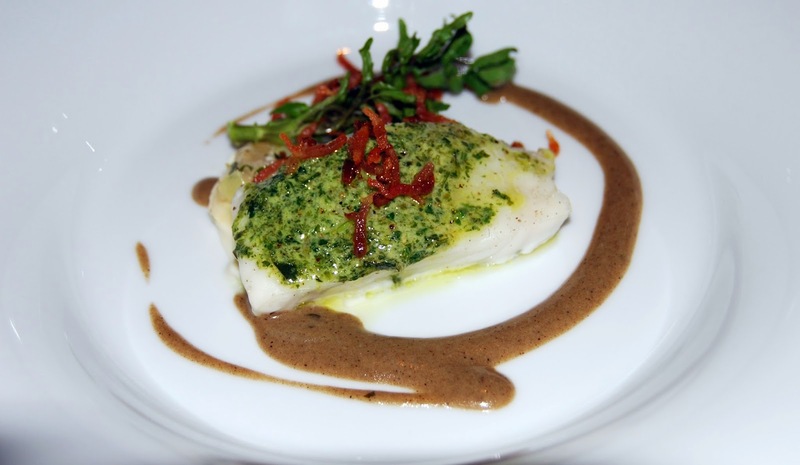 Next, an herb crusted turbot made its way to our table. 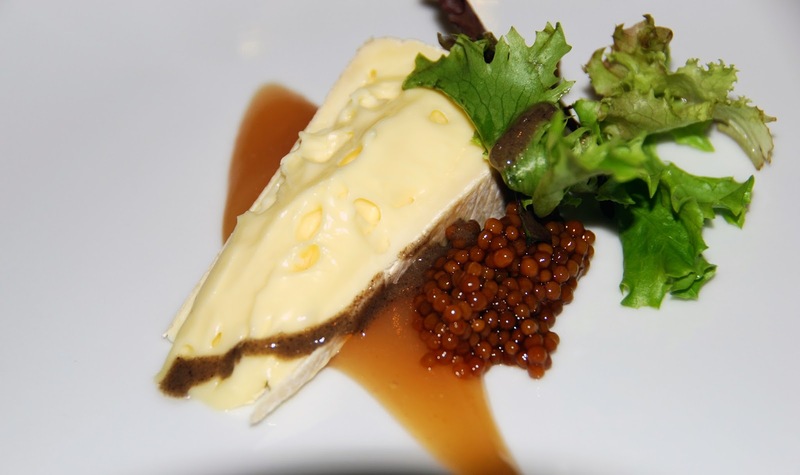 Prepared with celery root, leeks vinaigrette, bacon wild watercress and black truffle sauce, we couldn’t decide if it was perfect as is, or even more perfect paired with the som’s choice of a 2009 Chateau Fuisse Pouilly Fuisse from Macon, France. 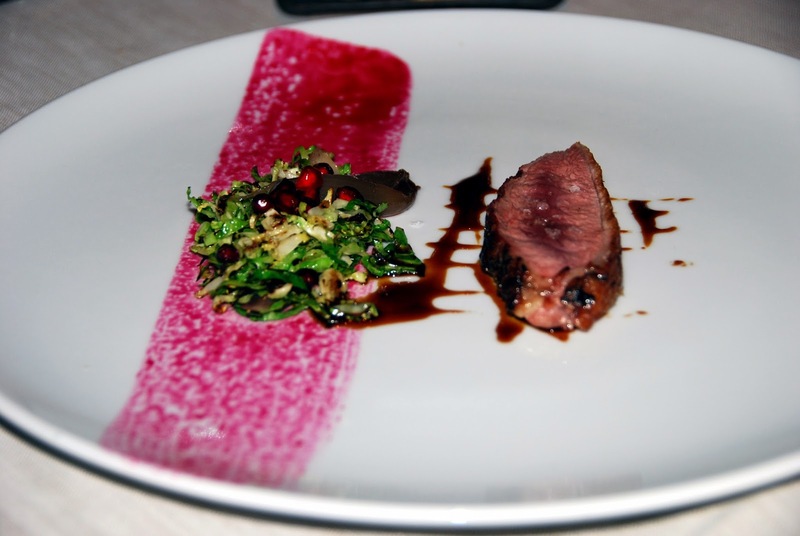 As the flavors of this exquisite dish remained on our tongues, the timing of the courses remained flawless with the arrival of a Sonoma duck, prepared with an onion confit, Brussels sprouts, chestnut and pomegranate jus. Who thinks of these things? Well, apparently Chef and Chef de Cuisine Abby Burk. We next enjoyed the Venison Loin. 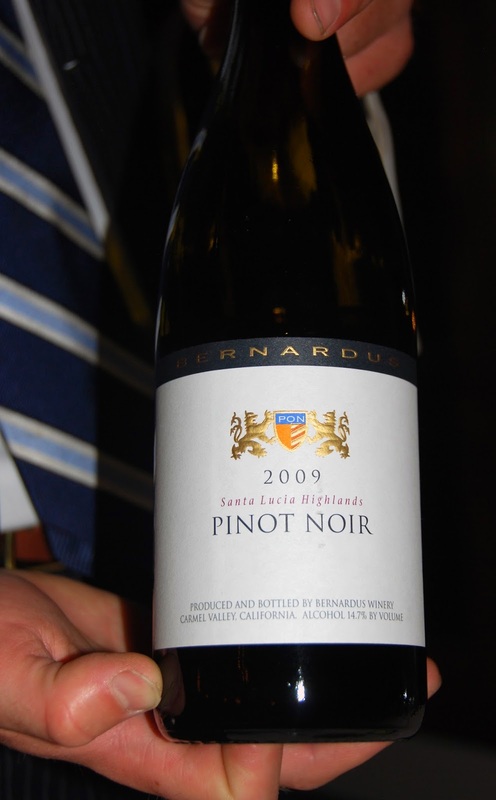 The breadth of this dish with its golden chanterelle mushrooms, pancetta, sweet potato and current-mustard jus was accentuated by a Syrah from the Santa Cruz Montains, a 2009 Frederick Williams Cellars. Scott joined Michael in the pants wetting completion with this amazingly broad and deep Syrah. As if we hadn’t had enough, the next dish the Chef called a “Dancing Fern” consisted of Sequatchie Cove creamery (Sequatchie, Tennessee) raw cow milk, heirloom apple puree and pickled mustard seed. Accompanied by a German Riesling (1997 J.J. Prum), we didn’t care at this point what were eating, just that it was beyond scrumptious. What would a meal be without a divine selection of cheese, honey and preserves. With a range from subtle to strong, there was something for everyone. The cheese was sophisticated and imported and simply yummy. 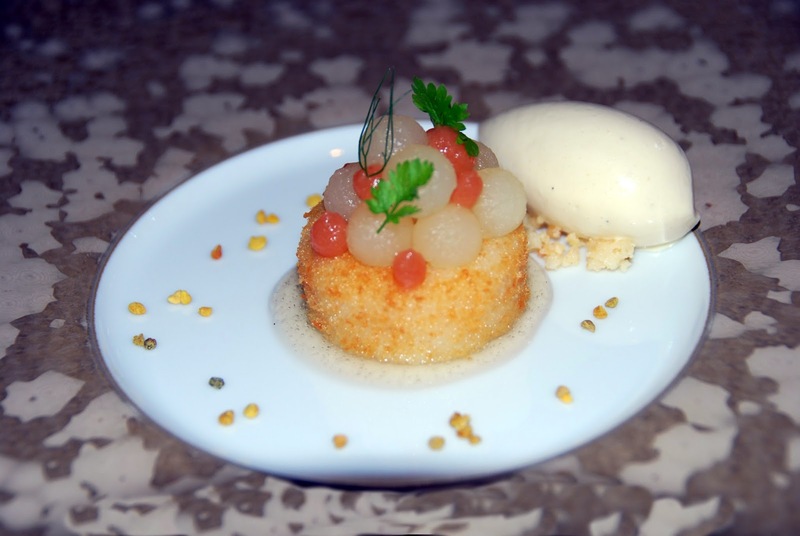 We topped off the dining experience with a crispy farina, poached pear, quince and honey ice cream, and an Austrian dessert wine, a 2011 Alois Kracher Auslese Cuvee, and it was a little bit of heaven on a plate. Is it possible to have a near flawless experience? Yes, and in fact as we stated above, we put this superlative dining extravaganza in the same category as some of the best restaurants in Manhattan. The only thing we really needed to do to improve this experience was roll out of the dining room and into a fabulous suite to dream of the entire evening all over again… Next time. The entire experience is one The Dining Duo highly recommends to our readers. 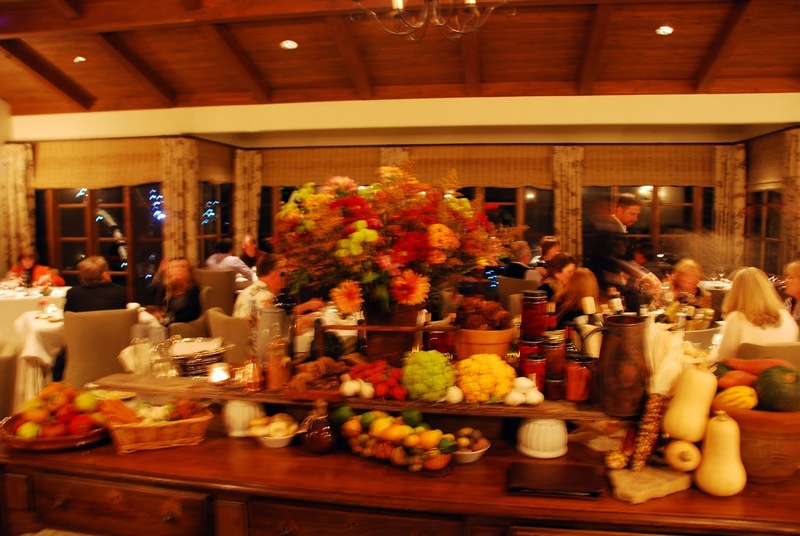 It’s worth a trip to the gorgeous Carmel Valley if only to come to Marinus at Bernadus Lodge. We will be back. • Recognized by Zagat Survey for the Top Restaurant in the Bay Area, Most Romantic, Best Wine List South of San Francisco, and the Bay Area's top vote-getter for "worth a trip"
• Voted World's Best Resort Restaurant in 2003 by Andrew Harper's Hideaway Report. 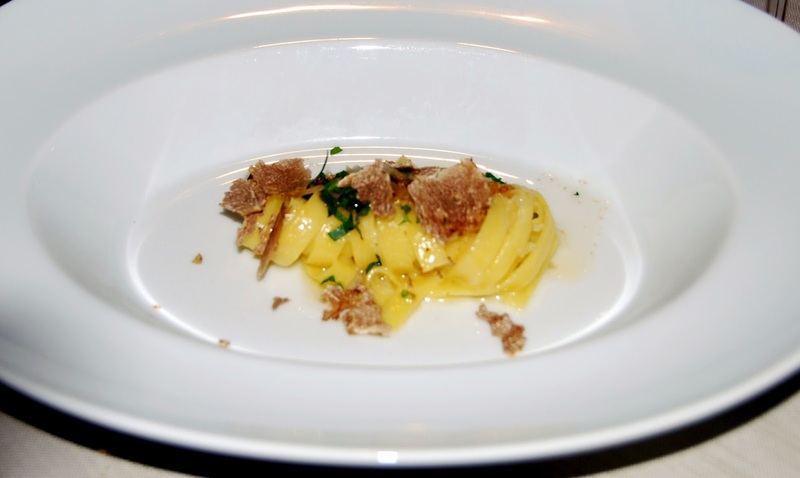 Michael H. Epstein & Scott E. Schwimer take on the food & Hotel scene around the globe. Lovers of food, life & each other, who knows more about luxury hotels & the restaurant scene than two partners who eat out 21 meals a week for 28 years together? Look for them at the best restaurants & resorts on the planet.